That famous line, which mutual-fund legend Sir John Templeton once called “among the four most costly words in the annals of investing,” is back in fashion these days when it comes to the Treasury yield curve. Skeptics from Goldman Sachs Group Inc. to Morgan Stanley Investment Management say the curve’s recessionary signals may be distorted now as a result of central-bank policy that’s kept interest rates exceptionally low since the financial crisis. Is it deja vu all over again? More than a decade ago, then-Federal Reserve Chairman Ben S. Bernanke dismissed the curve’s predictive powers after two of the most widely watched yield spreads inverted and then went flat. In Bernanke’s camp were then-Treasury Secretary John W. Snow and bond king Bill Gross. And we all now what happened next. That time was famously NOT different. The fact that yields on 10-year Treasuries are now back above those on three-month bills, after spending much of last week below, should not be mistaken as an all-clear signal. That type of “mini-inversion,” lasting one to eight days, can be a precursor to a longer-term episode, according to Luke, who has analyzed the history of inversions. A flashback to what some policy makers and investors were saying in 2006 and 2007, after the 2-year/10-year and 3-month/10-year spreads had started to flash warnings, reveals some arguments that sound similar to today’s skepticism that inversions signal an upcoming recession. Now a distinguished fellow in residence at the Brookings Institution in Washington, Bernanke declined a request last week for further comment on his 2006 remarks. Then-Treasury secretary Snow said in a Jan. 6, 2006, interview that “there’s no reason for great alarm” after the 2-year/10-year spread had returned to flat from an inversion the prior month. 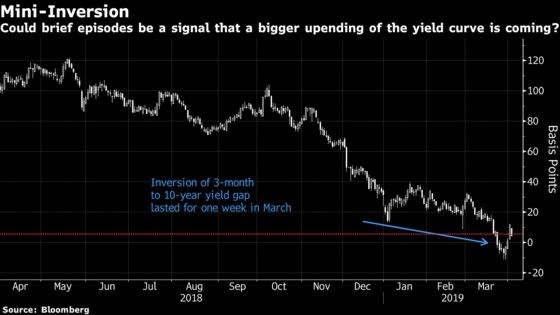 With rates low at both the front and long end, “the yield curve under these circumstances doesn’t foretell anything ominous for the economy.” Snow, now chairman of Cerberus Capital Management, said Tuesday that he stands by his statement. Dismissals of the curve’s warning signal back then were not confined to the Washington beltway. Bill Gross, then-manager of the world’s biggest bond fund and co-founder of Pacific Investment Management Co., said in a January 2007 interview that the shape of the curve wasn’t as accurate a recession predictor as it once was because demand for Treasuries by foreign central banks had distorted the traditional relationship. “I don’t think I’m concerned with it,” Gross said. “I don’t think Bernanke’s concerned with it.” Gross, who announced his retirement from Janus Henderson Group Plc in February, did not respond to a request for comment. Worries about an inverted 2-year/10-year curve amounted to “silliness,” Lou Crandall, chief economist of Wrightson ICAP in New York, wrote in a January 2006 note. In fact, few economists were standing by the theory that yield-curve inversions signaled a recession. “Ouch,” Crandall said Tuesday in reaction to his own 2006 views. “Forced to choose a simple yes-or-no answer, I would say that I still take that general view -- though with a little more nuance than just writing it off as ‘silliness’ in a throwaway line,” he wrote in an email. Inverted yield curves are “symptomatic” of late-cycle conditions when recessions are more likely and not “concrete” signals, he said. The decline in long-term yields over recent months “has made a recession less likely rather than more,” Crandall added. Then, as now, some analysts pointed to the negative effect the inversion would have on banks. Now with Dynamic Economic Strategy in Charlotte, Silvia stood by his quotes in a phone interview last week.